The presence of aggressive tankmates can be an important factor in the manifestation, progression of disease. 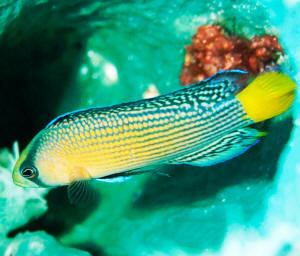 Pseudochromis splendens, the Splendid Dottyback. A quick question - thank you ahead of time. I have a 6 month old 10 gallon reef tank. Inhabitants are a few soft corals, 3 hermit crabs, 2 snails and 1 skunk cleaner shrimp. In 5 days I am "expecting" my first fish - 2 green-banded gobies, plus 2 Nassarius snails and a pom pom crab. I have read through most of the quarantine info on your site and my apologizes if I somehow missed the info I seek. I can set up a 5 gallon quarantine tank with sponge filter, etc as you recommend. new creatures to go directly (after acclimating, of course,) into my fishless system with great water, hiding places, etc?